There are 20 Assisted Living Facilities in the Columbus area, with 19 in Columbus and 1 nearby. The average cost of assisted living in Columbus is $2,173 per month. This is lower than the national median of $3,346. To help you with your search, browse the 69 reviews below for assisted living facilities in Columbus. On average, consumers rate assisted living in Columbus 4.0 out of 5 stars. Better rated regions include Valley with an average rating of 5.0 out of 5 stars. Caring.com has helped thousands of families find high-quality senior care. To speak with one of our Family Advisors about assisted living options and costs in Columbus, call (855) 863-8283. Columbus, Ga. offers residents a variety of things to do, including art exhibits, historical tours, the Frogtown Crawfish Festival and the River Walk Geo tour. Seniors can partake in these activities with family and friends from their assisted living communities. Assisted living facilities in Columbus fall under the authority of the Georgia Department of Community Health. For a community to stay in good standing under the department's guidelines, it must care for 25 or more people and provide for the distribution of medications by a certified medication aide. It must also provide help with or facilities for essential daily living activities. These EDLAs must include eating, bathing, grooming, dressing and toileting. There are 20 assisted living facilities in Columbus that meet these guidelines. The cost of living in Columbus is 18.5 percent lower than the national average, and the city enjoys a slight edge in health care costs. This makes it an attractive community for seniors who live on a limited budget. Columbus came in number 78 on the list of midsized cities for crime. This places it closer to the bottom than the top. Most of the crime in the area falls into the property category with its violent crime rating being below average. The Columbus area is home to world-class medical facilities, including St. Francis Hospital, Piedmont Columbus Regional and Columbus Specialty Hospital, in the event of medical emergencies or illness. With its own opera house, ballet company, performing arts center and many museums the city of Columbus offers a wide variety of art and cultural activities for seniors to enjoy. Historical tours, concerts, plays and meditation classes are just a few of the free options available in the city. Columbus enjoys more sunny days each year than the average U.S. city, but it also receives 9 more inches of rain due to frequent thunderstorms. Summer highs in the low 90s and winter lows that rarely approach the freezing mark make the climate in Columbus ideal for seniors who suffer from joint pain in colder weather. Columbus has an array of community resources for seniors, including the Golden Agers Senior Adult Program an organization that offers fellowship, transportation, health screenings services and recreational activities as well as four other senior centers. Assisted Living costs in Columbus start around $2,173 per month on average, while the nationwide average cost of assisted living is $4,000 per month, according to the latest figures from Genworth’s Cost of Care Survey. It’s important to note that assisted living rates in Columbus and the surrounding suburbs can vary widely based on factors such as location, the level of care needed, apartment size and the types of amenities offered at each community. Seniors who qualify can apply for financial aid to help pay for assisted living facilities in Columbus through two state-operated Medicaid waiver programs: the Community Care Service Program (CCSP) and Service Options Using Resources in a Community Environment (Service Options Using Resources in a Community Environment (SOURCE). 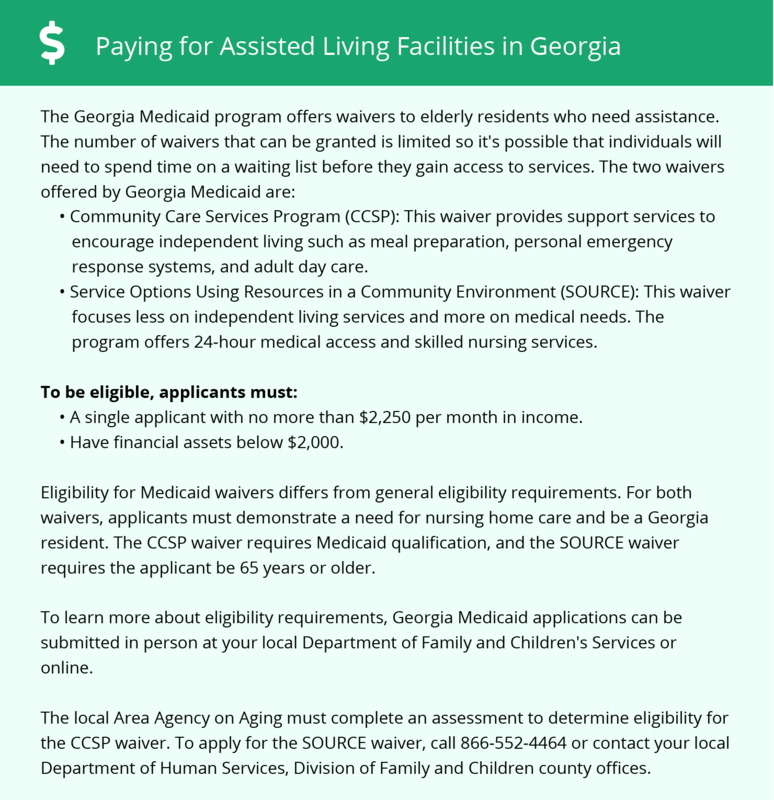 Learn more about these programs, plus who’s eligible, on our Assisted Living in Georgia page. For more information about different ways to finance assisted living, visit our Assisted Living in Georgia page. Columbus and the surrounding area are home to numerous government agencies and non-profit organizations offering help for seniors searching for or currently residing in an assisted living community. These organizations can also provide assistance in a number of other eldercare services such as geriatric care management, elder law advice, estate planning, finding home care and health and wellness programs. To see a list of free assisted living resources in Columbus, please visit our Assisted Living in Georgia page. Columbus-area assisted living communities must adhere to the comprehensive set of state laws and regulations that all assisted living communities in Georgia are required to follow. Visit our Assisted Living in Georgia page for more information about these laws.